1. Is it Really a Bee? Some wasps and flies look very similar to bees. 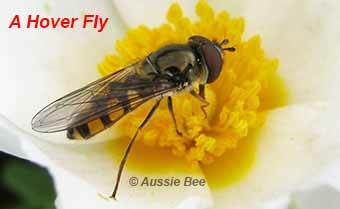 In fact, Hoverflies (see photo below) are often mistaken for bees. To tell them apart, you need to look closely at your insect's wings, legs, eyes and antennae. Is your insect a bee, a wasp or a fly? More info and photos on bees, wasps and flies. Above: Hover Flies are common garden visitors, sipping nectar from flowers. Some flies are mimics -- they have black and yellow bands that make them look like bees and wasps. 2. Is it a Native Bee? -- Mediterranean Emerald Furrow Bees (NSW). Is your insect a native bee or an introduced bee? 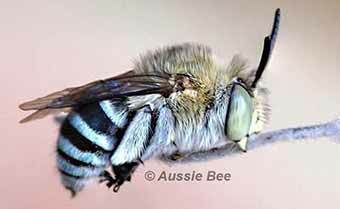 More info and photos on introduced bees in Australia. 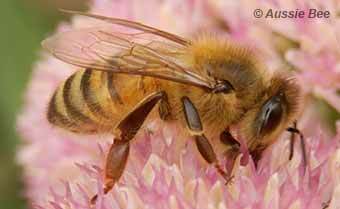 Above: The European Honeybee is a valuable species used by commercial apiarists to make honey and pollinate crops. However, it has also gone wild and built feral nests in the bush in most parts of Australia. It is one of the most common bee species that gardeners notice. 3. What Type of Native Bee is it? We have over 1,700 species of native bees in Australia. They come in an impressive range of sizes and in a dazzling array of colours. -- Our largest species, the Great Carpenter Bees, are ten times longer than our smallest species, the Quasihesma Bees (see photo)! 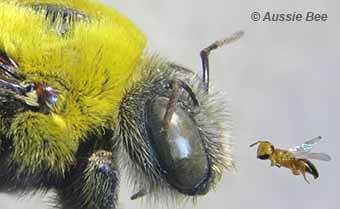 -- Native bees can be furry or shiny, and they can be black, red, yellow or brown. Some are vivid metallic green and others are black with blue polka dots! Above: Australia's largest bees, the Great Carpenter Bees Xylocopa (17 to 26mm), are 10x longer than our smallest bees, the Quasihesma Bees (2mm)! -- Is that a Bee, a Wasp or a Fly?